How we work as a team and communicate with each other are essential elements of a healthy culture. Improving non-technical skills such as how we communicate, how we respond to the environment around us, and how we work together in a team are crucial for achieving high quality patient care. We offer a free and interactive 13-week Action Series that focuses on skills and tools to improve teamwork and communication on your team. In the first two waves of the Action Series, nearly 90 teams have participated with over 600 total participants from across BC! Registration for Wave 3 is now closed. 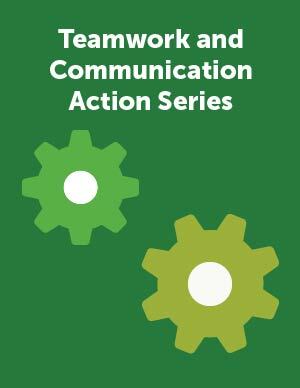 Sign up for our newsletter to be the first to know about news on the Teamwork & Communication Action Series. What is an action series? Curious what past participants gained from the Action Series? Teams must attend all five webinars, and commit to practicing within and sharing across teams between action periods. Nothing! This is a free opportunity for teams across BC. The Teamwork & Communication Action Series began with the aim of improving teamwork and communication within the BC health care system. We have been evaluating the series to measure this improvement. Clear is a voluntary initiative that supports long-term care homes to reduce the number of residents who are prescribed antipsychotic medications. RT2C provides participating organizations with an opportunity to engage point-of-care staff in leading change to improve care for patients, clients or residents.